Many of the best attractions in Siberia are situated on the southern side and around Tomsk. These attractions include Abakan, which is capital of Russia's Khakassia region and to the south-east of Tomsk. Also reasonably close to Tomsk is the prosperous and bustling industrial city of Barnaul, which was established in 1730. Those heading to Minusinsk should not miss the neighbouring attractions within Salbyk, where a dramatic group of standing stones are often referred to as the Siberian Stonehenge. One of the largest and most noteworthy cities in this part of Russia is Novosibirsk, which is sited to the south-west of Tomsk and is the place to head if you crave a lively nightlife. However, since Russia is such a vast country, many of these destinations and attractions are too far from Tomsk for actual day trips and more suitable for overnight excursions or weekend breaks. Crammed full of restaurants and Irish pubs, Novosibirsk offers a definite Las Vegas vibe and is an exciting place to spend an evening. 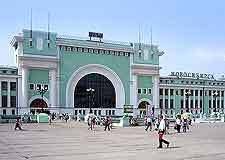 Novosibirsk is a vast city and stands around 260 km / 162 miles from Tomsk. The main attractions in Novosibirsk can be found around the central Prospekt Lenina, on the intersecting Krasny Prospekt, and across the Ob River, on the Ulitsa Karla Marksa. Novosibirsk is actually the largest city in Siberia. Abakan is a pleasant transport hub and busy port, which began its life in the early 18th century as a Russian fortress (Abakan Fort) and is now home to more than 160,000 residents. The main attractions lie on the streets of the Prospekt Lenina, the Ulitsa Shchetinkina, and also the Ulitsa Pushkina, where the Museum of Khakassia resides. 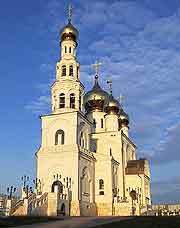 Also of interest is the rather beautiful Spakso Preobrazhenskoy Cathedral, which presides over the Prospekt Druzhby Narodov and features eye-catching golden onion-shaped domes. 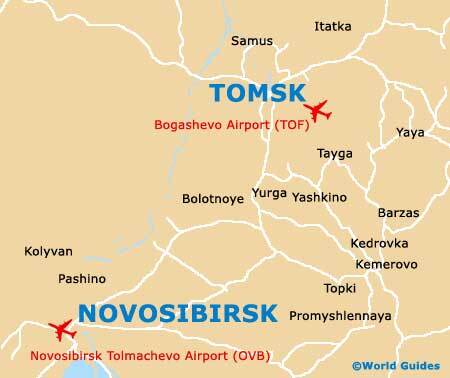 Minusinsk stands a relatively short distance to the south-east of Tomsk. Just over 80,000 inhabitants currently call Minusinsk their home. 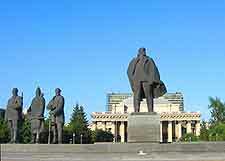 Minusinsk is the perfect day trip from Tomsk and offers a better selection of attractions than neighbouring Abakan. Look out for the Saviour's Cathedral, the Martyanov Museum, the Vilner Palace and the award-winning Drama Theatre. The city of Barnaul currently boasts a population of around 650,000 people and has expanded greatly in recent years. Barnaul has grown up around the Ob River and is especially close to the mountains, being located south-west of Tomsk. Hosting the premier airport to the region known as the Altai Republic, Barnaul has plenty of museums and restaurants to keep you fully entertained. 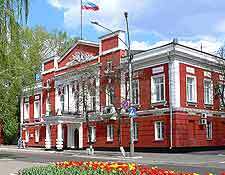 The main attractions in Barnaul include the Altai Fine Art Museum, the War History Museum, and also the Altai Arts, Literature and Culture Museum, which is situated on the Ulitsa Tolstogo and is housed within a renovated mid-19th century mansion. An important Russian city based around the Tom River, Kemerovo is extremely close to Tomsk and is to be found just a stone's throw to the south, and also to the east of Novosibirsk. Kemerovo now has a population exceeding 550,000 and is served by the nearby Kemerovo International Airport (KEJ). The city is home to both the Kuzbass State Technical University and the Kemerovo State University, and is a great place for a spot of shopping, being home to a large, modern shopping mall.